In 1895 a severe outbreak of anthrax occurred among the livestock of Jerry Deskin at Moberly, resulting in the loss of five cattle, twenty-two hogs and one mule. This stock was placed under strict quarantine, were all vaccinated with Pasteur's Anthrax vaccine and no more losses were reported to the state veterinary office (Missouri 1895 9). In November 1924 an outbreak of anthrax appeared on Sullivan Island in Ray County. The infection was undoubtedly contracted from the soil having been deposited there by previous flooding. The outbreak occurred on the farms of Rocklage and Stockton. The herd originally contained 90 head of steers purchased at the Kansas City Stockyards. 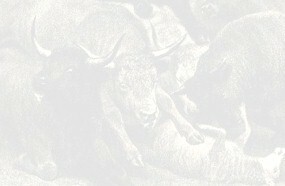 The steers had been purchased from a speculator. Therefore it was impossible to ascertain their point or origin. Nothing out of the ordinary was noticed until November 9th when a few sick cattle were noticed. The owners immediately called Dr. S. S. Morgan of Richmond who made a diagnosis of anthrax. Dr. A.T. Kinsley of Kansas City confirmed this diagnosis. Dr. Morgan immediately placed the herd under a rigid and strict quarantine, and the simultaneous treatment was immediately given. This apparently checked the inroad of the infection. However, in about five days the disease broke out again in a very malignant form. The serum alone treatment was then given by Dr. Morgan, which succeeded in gradually stopping the outbreak, but not until 38 steers had died was the disease completely controlled (Missouri 1924 218). Much excitement resulted among the cattle owners of Ray County as a result of the outbreak. In order to prevent any depression of the cattle business in that part of the state the State Veterinarian hoped to avoid any publicity in connection with the matter. The "hope" did not materialize, as numerous editorials and newspaper articles appeared (Missouri 1924 218). Missouri Yearbook of Agriculture. 1895. Jefferson City, MO. Tribune Printing Company, 1896: 9. Missouri Yearbook of Agriculture. 1915. Jefferson City, MO. Missouri State Board of Agriculture: 551. Missouri Yearbook of Agriculture. 1924. Jefferson City, MO. Missouri State Board of Agriculture: 218.